Whether you are looking to learn some self-defense moves or need to get in shape, our school is the ultimate training ground for people of all fitness and skill levels. With the event of mixed martial arts (MMA) becoming mainstream in the media, more and more people are looking to martial arts and self-defense classes as an alternative to the usual gym and fitness routine. At Family Fitness Karate and Kickboxing, we have been training in and teaching martial arts long before the media hype. We proudly bring forth this tradition to new generations of martial artists by offering a variety of classes to our students. 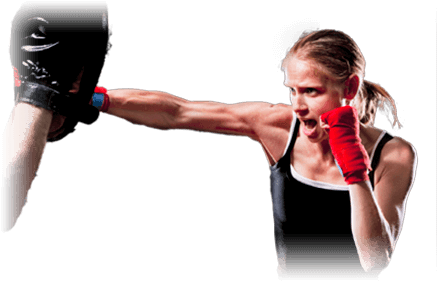 The Family Fitness Karate and Kickboxing Plan: To Help You Achieve Your Goals. Family Fitness Karate and Kickboxing teaches traditional martial arts in a modern fitness environment. The students in our programs experience a number of life-changing physical and mental benefits. We'll help you learn how to land powerful strikes in a high-energy format that burns fat and builds total-body strength. At Family Fitness Karate and Kickboxing, we are proud to work with men and women of all skill levels. Muay Thai is known as the “Art of Eight Limbs” because it is characterized by the combined use of fists, elbows, knees and shins. It engages your entire body and is a great alternative to traditional fitness methods. You’ll learn proper techniques in a controlled environment as well as important self-defense skills that can be applied to real world situations.